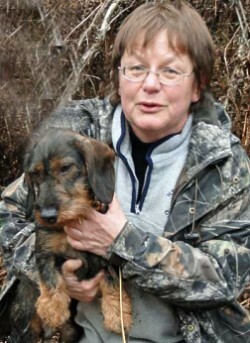 Standard wirehaired dachshunds are our passion. 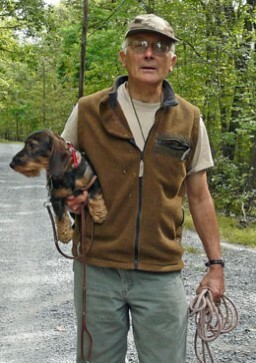 We began our breeding and training program for tracking dachshunds in the Mid-Hudson Valley of New York State. In 1999 we moved to Berne in Albany County about 25 miles southwest of the state capital. Here amid the deer and wild turkeys we train and breed our dogs under "von Moosbach-Zuzelek" kennel name. We usually have two litters of puppies a year. Beyond our 30 acres there are thousands of acres of state land where the dogs do advanced training. Since this is deer hunting country we are constantly driving to take deer calls during hunting season. We look forward to tracking occasional bear in the Adirondacks to the north or the Catskills to the south. 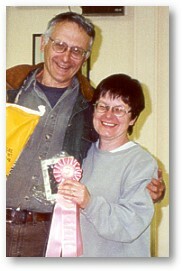 We are active members of Deer Search Inc. and co-founders of North American Teckel Club and United Blood Trackers. We work hard at educating hunters about the use of tracking dogs for recovery of wounded big game. In 2003 we created a self-publishing company Teckel Time and published John's book Tracking Dogs for Finding Wounded Deer. Due to high volume of inquiries we might not be able to respond right away. We will appreciate your patience. If you don't hear from us within several days, try to contact us again. We are especially busy during our hunting and tracking season (October-December).